Tonight at the Royal Albert Hall we are ghosts. We’re ghosts in the high places where the arches of the Royal Albert Hall sit regal, dramatic. We’re ghosts in the seats that remain unsold, ghosts that lurk in the bubbles of my glass of champagne. There are ghosts behind me, ghosts gathered in small groups of friends below. Clutching beers and ciders in crooked hands, staring at wrinkles and the passage of time. The lights drop. Interpol take the stage amidst thunderous applause. Before the first words are even sung, eerie, lonely notes of ‘Pioneer to the Falls’ pitter-patter out across the misty hall. A disco ball is lit from the front, scattering a veil of glitter across the darkness. If this were a regular gig, maybe these ghosts wouldn’t matter. If this were a regular gig, these displaced bundles of energy – ghosts in the form of a personal sadness held heavy in the chest might shine bright but once or twice in the night. They might haunt the edges of our consciousness, the monsters we’re unsure we saw, the subtle shrug when our wayward best friend asks us how we’ve been since that breakup. They might be subtle, careful, nuanced. But tonight is no regular gig. Tonight we watch Interpol, prophets of sadness, straight off the back a successful anniversary tour of their seminal and hugely influential Turn On The Bright Lights. The energy exchange in the room jumps up, fervent excitement akin to kids on Christmas morning. We edge into ‘If You Really Love Nothing’, ride the rollercoaster that bursts straight out of our hearts. Tonight our ghosts long for music as art, and glow – charged with the energy in the room. They open that cavern in our chest and we bleed forth their secrets, rabid, terrible – in a concert hall with a bunch of strangers. It is tonight through Interpol, we blend these ghosts with reality. Our torch songs, our nihilism. Of our ghosts we have been given permission to be proud. There’s a slight misstep in the intro of ‘Say Hello to the Angels’, Interpol paralysed by error for a half-moment. When they restart, the track is at almost twice it’s normal speed. They compensate for the energy lost, give us twice as much power for the ride. It’s no surprise that this is an immersive experience. After all, isn’t sadness immersive? Highlight. ‘NYC’ a personal track for me. I think about the nature of duality. How the same words apply to opposite points of my long gone once-dramatic situation. It takes a great wordsmith to write songs like these. This is the point my arms cover themselves in goosebumps, which continue to ride the energy waves, right through to the end of the gig. We’ve all had ghosts that choke us so hard we feel as though we might drown. 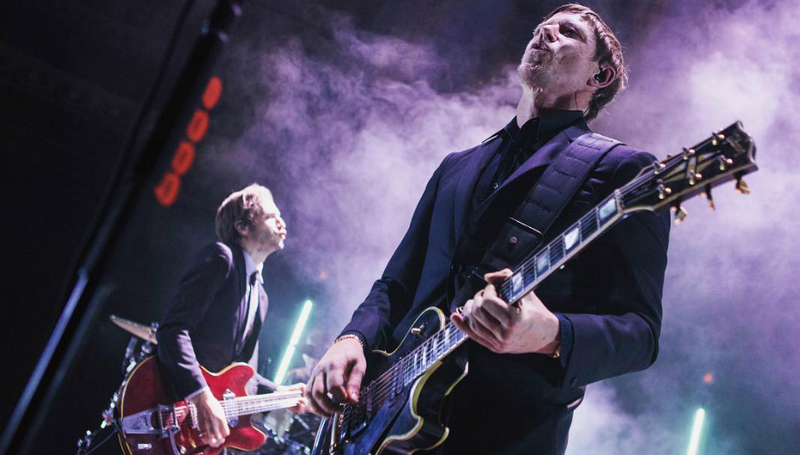 It’s this feeling that tonight populates Interpol’s music – more than ever - a lilt sweet apathy. I’ve seen them before but not so tight, so energised, so slick. They’re aflame. Thus-ward the energy continues. Up and down. Crowd favourites lie in older tracks, the gaggle of fans who’d have been 17,18,19 when they heard Turn On The Bright Lights let up rapturous cheers whenever there is an “oldie”. Interpol tonight draw in the powder of sadness, they package it – give it back to us to and whisper: No. Celebrate! It’s not too much of a surprise then that the setup of the stage is designed to draw you into this immersive state. Each song has its own colour setting, a synesthetic symphony, and enough dry ice to choke me, way back in the boxes. But you know, I love it. If ‘Not Even Jail’ and ‘Slow Hands’ rise to the middle of a peak – ‘Obstacle 1’ absolutely breaks it. The grandiose barriers, if anyone had any left, are pulled down; and the crowd becomes a family and that family is airborne. After all, what is our sadness without celebration? For us, here, Interpol are angels of melancholia. Tonight as we listen we teach our ghosts that its ok to suffer, beautifully, ok to put that down as art-music – ok to be overwhelmed because the result is oh so beautiful. The result is light and noise. Flashing rainbow lights slashing at the darkness. The result is a glitterball, lit from the front, casting a veil of glitter across the crowd. The result tonight is Interpol at their finest. Disciples of sadness.